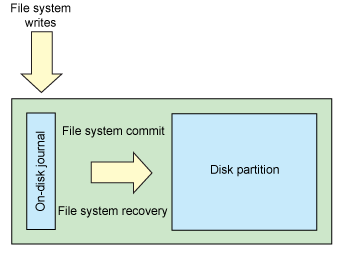 I was reading trough the link on journaling-filesystems and i would like to know where exactly is the journal stored in my Harddisk. The journal is stored in a separate space of the partition, you cannot access it directly. You can use sudo debugfs /dev/sda# where the # symbol is the number of your partition, and then using logdump in debugfs to print it out. The output is confusing though. Generally, as a regular user, you don't need to know about the journal. Using ext3/4 will be sufficient to prevent data loss (in most cases). There is no fixed place for the journal, each filesystem stores it in a different place. If you are expecting it to be a regular file, then your are mistaken, it's more like a part of the filesystem structure like the inode table. The funny point is that ext3/4 treats it exactly like a regular file. It is usually found in the inode number 8, but this is a kernel parameter that can be changed at compile time. If you want to get technical, this article by Carlo Wood, written in March 2008, is a great read about the ext3 structure. Will the deleted browser history be stored in File-system? How do I install the btrfs-restore utility on 12.04? How to remove the preview image on video and picture files in foldes? Accidentally partitioned media drive as ext3 during install (was ext4), how can I recover? Is it safe to use Bleachbit in a ext4 filesystem with journaling?